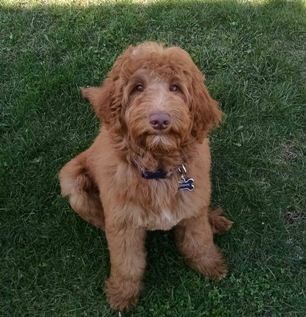 Cooper is a standard Multi-gen Australian Labradoodle with a gorgeous wavy caramel fleece coat. DOB 11-21-15. His parents are our own Tally & Turner. Cooper lives in a guardian home nearby and is definitely therapy quality which is what we look for in all our breeding dogs. Health testing – OFA prelims Hips excellent, elbows good, IC clear. Genetic testing in progress. DNA Color Code bbee.